Interest in exotic animals goes back to ancient Egyptian, Greek and Roman civilisations. However, it was not until the later 18th century that interest in the study of uncommon animals began in earnest, with scholars now seeing them as of interest to biology, rather than just as spectacles or curiosities. As European explorers made their way to Australia and other previously uncharted regions of the world, they found entirely new animals to observe and study. The first zoos were set up in the 18th century with the goal of documenting and studying different species. After the Habsburgs established the Tiergarten Schönbrunn in Austria in 1752, the French followed with their Ménagerie du Jardin des Plantes in 1793. The Jardin’s director, Georges-Louis Leclerc, Comte de Buffon, set out to document all the known animal species in his Histoire Naturelle, Générale et Particulière. Books presenting these animals in the late 18th and early 19th centuries, like Gould’s Birds of Australia, the First Fleet journals, and Arcana, served to supply this need. The illustrated plate books of the 19th century are beautiful examples of elaborate and expensive zoological works. Gould’s Birds of Australia (1840–1848) is one of Australia’s most iconic books, both as a scientific work and for its artistic merit. It was created during a time of lavish plate books. Originally it was issued in parts by subscription from 1840 to 1848 in an edition of 250 copies. There are 681 hand coloured lithographs in all, some by Gould’s wife Elizabeth, but most by H. C. Richter. 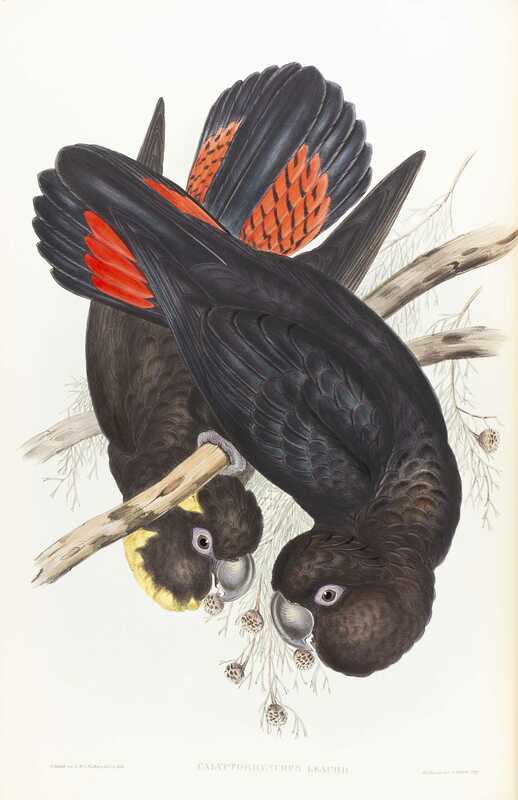 Displayed here is volume 5, plate 10, featuring Leach's red-tailed black cockatoo. An Account of the English Colony in New South Wales: With remarks on the dispositions, customs, manners, &c. of the native inhabitants of that country. To which are added, some particulars of New Zealand. 2 volumes. David Collins’s Account is one of the most comprehensive of the existing First Fleet journals. Collins arrived in Botany Bay on 20 January 1788, having sailed from England aboard the Sirius. From Botany Bay he travelled to Port Jackson, where the fleet settled at Sydney Cove. After settlement, Collins became the deputy judge advocate of the early New South Wales colony and oversaw its entire legal system. Collins’s journal chronicles not only the voyage of the Sirius and the establishment of the colony, but also provides detailed encounters with Indigenous people, charting the land’s topography, and describing flora and fauna. People the world over took great interest in the new and exotic animals being described by British travellers and settlers. 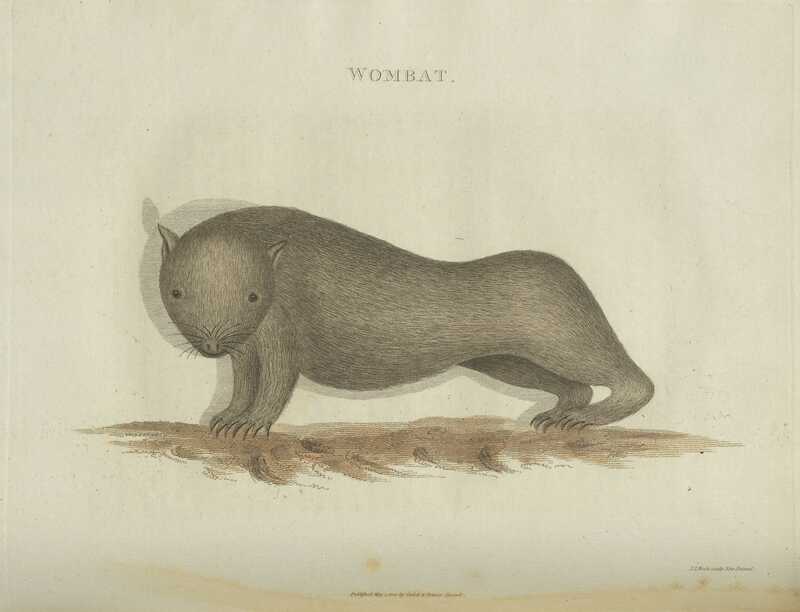 Shown here is an engraving of a wombat, produced in London by Samuel John Neele (1758-1824). Such engravings were typically based on watercolour sketches by naval artists and convicts, many of whom were uncredited. Arcana, or, the Museum of Natural History: Containing the most recent discovered objects embellished with coloured plates ... combining a general survey of nature. 2 volumes. 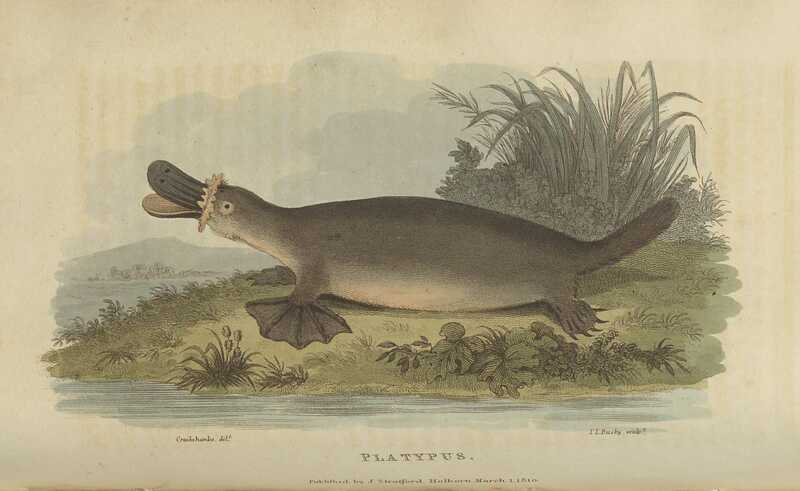 When accounts of the platypus were relayed back to European naturalists, they were met with an incredulous response. As a result, some of the early artistic impressions of these strange animals were quite fanciful. The engraving shown here is one of the earlier renditions accomplished in the famous George Cruikshank’s London studio, although it is signed here as ‘Cruickshanks’.